The Royal Aircraft Factory’s BE2 was the result of Edward Busk’s exhaustive experiments in 1914 to achieve automatic stability; his aim to produce the steadiest possible platform for reconnaissance operations. At that time such qualities were considered desirable since the military had yet to fully acknowledge the aeroplane as a potent war weapon. BE2s successfully fulfilled their intended roles in the early part of the war until the advent of superior German aircraft such as the Eindeckers and early Albatros fighters against which BE2 crews had little hope of providing serious opposition. However, BE2s remained fulfilling their vital artillery spotting and reconnaissance role long after they became obsolescent because of delays in replacing them. Sixty aircrew died in BE2s in ‘Bloody April’ 1917 during the Battle of Arras and one or two were recorded still in France a year later. Some were withdrawn in early 1916 to counter the Zeppelin threat and as a home defence fighter the BE2 proved ideal for nocturnal operations, three German airships falling victim to RFC BE pilots. The type enjoyed extensive use in most theatres of the war and was built in large numbers ending its days as a training aircraft in the newly formed Royal Air Force. BE2e, A2943, is in No 7 Squadron colours of WW1. The aircraft is recorded as being flown by Captain Horace Webb-Bowen RFC. It was used for bombing and reconnaissance including the Battle of the Somme before being eventually replaced in the same role by the RE8. BE2e, A2767, is recorded as flying a total of 3 operational missions from Stow Maries Aerodrome in Essex as part of B Flight No 37 Squadron. These sorties took place at night in September and October 1917 and averaged just under 2 hours each. By this stage in the War, A2767 was responding to Zeppelin attacks as well bombing raids of massed formations of the German Gotha, and ultimately Giant, bombers. BE 2 (A2943) is operated by the World War 1 Aviation Heritage Trust (WW1 AHT) from its base at the Stow Maries Great War Aerodrome near Maldon in Essex. 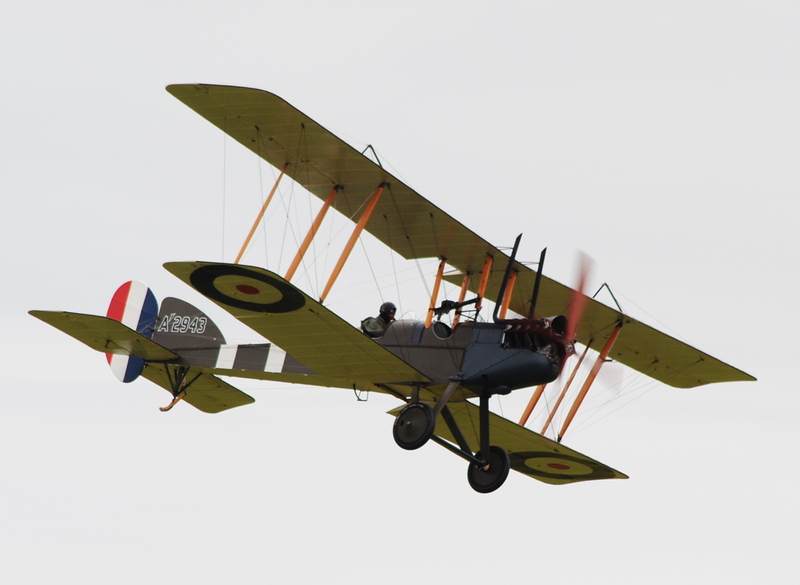 Both aircraft were constructed in 2014 by the Vintage Aviator Ltd (TVAL) of Wellington New Zealand and are authentic in every detail to the original design – an RAF1a engine, no brakes, bungee cord for suspension, Irish linen covers the aircraft, a single magneto, and a straight and level speed of 55 mph. A2767 was returned to NZ in Sep 2017.